This is the first time I've played along with the Ways to Use It Challenge on SCS. This week's challenge was all about white. 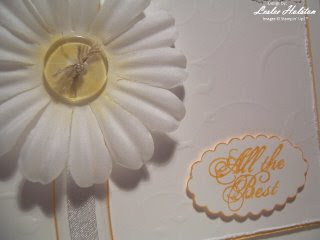 White card stock, ink, embellishments...and different ways to use it. Well, I knew just what I wanted to do and it didn't turn out at all like I had planned but I do like the way it turned out. I had started out to do an ALL white card but it was missing something. I couldn't put my finger on it so this is how it turned out. All embellishments started out white and I altered them by adding a sponge of Summer Sun pastel in the center of the flower and a Summer Sun marker down the edge of the white organza ribbon. The button is clear. I strung linen thread around the ribbon, through the flower and the button and tied it off on top. I love the effect. Here's a close up. The sentiment was punched with the scallop oval and I markered around the edge with Summer Sun. 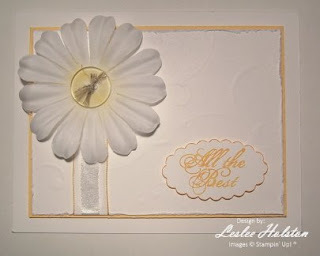 The white card stock is textured using the Big Shot Texturz plate, Background #1, and layered onto a piece of Summer Sun. It's a sweet, simple card. Change the accent color and the sentiment for a quick, new look. I think I'll keep working on that all white card too. Thanks for stopping in today. May you be inspired to find new 'ways to use it'!